Hyundai Motor is looking for a local partner to mass-produce an electronic scooter it unveiled at the Consumer Electronics Show last year, an industry source told The Korea Herald on Monday. The carmaker has transferred the design of the scooter to its locomotive manufacturing unit, Hyundai Rotem, in preparation for mass production, according to an industry insider who declined to be named. “Rotem officials are searching for a partner here to manufacture the first batch of Ioniq scooters,” said the source. Since its debut last year, rumors have circulated that the South Korean carmaker would manufacture the foldable scooter, considering the growing market for personal mobility devices inside and outside the country. The 4-inch-wheeled personal transporter is powered by batteries and designed to be portable. According to CNET, the automaker filed a US patent application for “a folding personal mobility vehicle” on July 5. Hyundai Motor is in the process of selecting a bidder, said a company representative. 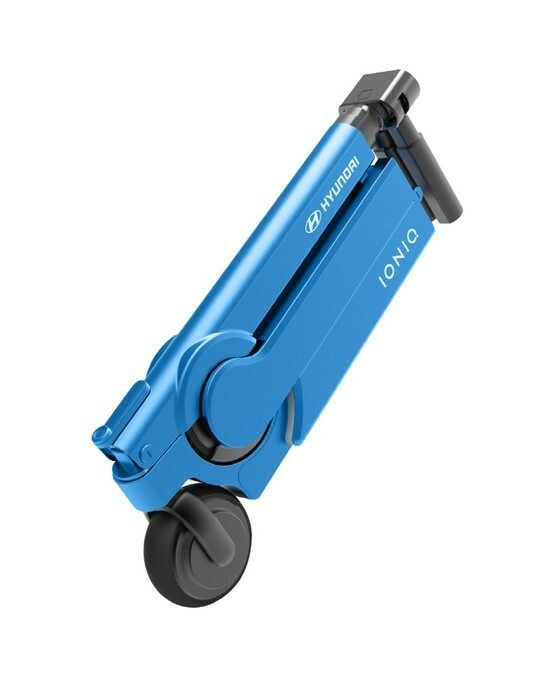 The carmaker will manufacture Ioniq scooters on an original equipment manufacturing basis, and Hyundai Rotem is among a number of candidates for the planned bidding. Hyundai Rotem, meanwhile, said it is not certain whether to participate in the bidding, but said it has been reviewing the case of mass-producing Ioniq scooters. Hyundai Rotem is the sole manufacturer of trains in Korea and also manufactures defense and industrial equipment. It has various research and development units, including one that focuses on wearable devices.